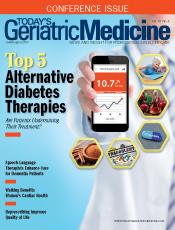 Top 5 Alternative Diabetes Therapies: Are Patients Undermining Their Treatment? 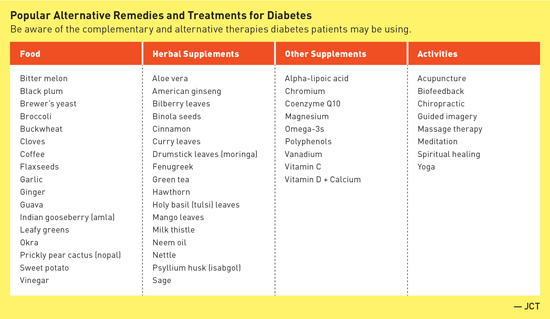 Patients with diabetes are turning to unregulated and understudied supplements, foods, and other alternative treatments. Although some may prove useful, others carry risk of real harm. Complementary and alternative treatments can take the form of foods, herbal remedies, supplements, activities, or even illegally marketed diabetes drugs. Below is a detailed description of a popular choice in each of these categories. Various foods are purported to help with blood sugar control. Many, such as bitter melon or prickly pear cactus (nopal), are used in traditional medicine. While preliminary research on a variety of foods has found promise for some and is beginning to elucidate mechanisms of blood sugar control, most studies are either animal studies or human studies too small or flawed to be definitive. Apple cider vinegar is a popular example of a promising food whose popularity has gotten ahead of the research. Studies show that people with diabetes are more likely to use supplements than people without diabetes.16 "The American Diabetes Association doesn't recommend the use of any dietary supplements for patients with diabetes," says Eileen Sturner, MBA, RD, CDE, BC-ADM, manager of the Abington-Jefferson Health Diabetes Center and Nutrition Center in Abington, Pennsylvania. "The 2017 Standards of Care state there's no clear evidence that supplements improve outcomes unless people have underlying deficiencies. There may even be some safety concerns with long-term use of antioxidant supplements like carotene and vitamins E and C." Despite the lack of official recommendations, supplements such as alpha-lipoic acid, vanadium, coenzyme Q10, and even vitamin D are all marketed as treatments for diabetes or its complications. One supplement with its roots in medical fact is chromium. Alternative treatments such as acupuncture, biofeedback, guided imagery, and yoga have been studied to one degree or another as a part of diabetes self-management, with some positive preliminary results. According to the FBI, older adults are common targets of fraud schemes and are particularly susceptible to fraudulent health claims.2 Patients should be made aware that there are many unregulated, illegally marketed, and potentially dangerous diabetes drugs available. These drugs may contain harmful ingredients or may be improperly marketed as over-the-counter products when they should be marketed as prescription drugs. FDA laboratory analysis found that some "all natural" products for diabetes contain undeclared active ingredients found in prescription diabetes drugs. According to the FDA, these drugs may interact in dangerous ways with prescribed medications, and there is a danger that patients taking illegally marketed drugs may decide to discontinue or delay effective treatments.27 "People with chronic or incurable diseases may feel desperate and become easy targets. Bogus products for diabetes are particularly troubling because there are effective options available to help manage this serious disease rather than exposing patients to unproven and unreasonably risky products," says Jason Humbert, a commander with the US Public Health Service, of the FDA's Office of Regulatory Affairs. It is essential that health care professionals maintain awareness of CAM therapies and their potential risks and benefits, and communicate this information effectively with their diabetes patients. Use of CAM by patients with diabetes is prevalent, and lack of proper communication can result in disease mismanagement.3 Including questions on intake questionnaires about supplements and any other steps patients are taking to improve their health and creating a nonjudgmental atmosphere may encourage patients to be forthcoming about their efforts to improve their health or diabetes management outside of prescribed care. Once patients have opened up about their activities, Sturner recommends open-ended questioning. "Listen, be understanding, and ask open-ended questions," Sturner says, such as, "Can you tell me why you chose to take that? Has it made a difference?" Chaparro recommends providing patients the information they need to understand the impact of what they are doing. "Get back to basics," Chaparro says. "Let them understand how their body works, and what this treatment might do." Emphasizing the need for evidence-based practice may help. "We explain that we put patient safety first," Sturner says, "and go over what the evidence says about risks and benefits." — Judith C. Thalheimer, RD, LDN, is a registered dietitian and principal of JTRD Nutrition Education Services, LLC, outside Philadelphia. Offer the following tips to patients to help them use supplements and other complementary treatments safely. • Avoid drug interactions. Encourage patients to inform all of their health care professionals about any and all complementary treatments they are trying and to continue to take conventional medication as prescribed. • Ensure the site requires a valid prescription. • Look for a physical address in the United States. • Ensure licensure by a state pharmacy board. • Check that there is a state-licensed pharmacist available to answer questions. • Take a systematic approach. If a patient wants to try a supplement or treatment (and it can be determined that this treatment is not dangerous or detrimental to health), suggest trying it for a limited period of time. Work with patients to determine whether A1c, blood sugar control, or quality of life has improved after the trial period. • Monitor kidney and liver function. Patients may not realize that "natural" remedies can have adverse effects. Recommend laboratory tests for kidney and liver function to ensure the supplement is not harming the patient's health. 1. Kesavadev J, Saboo B, Sadikot S, et al. Unproven therapies for diabetes and their implications. Adv Ther. 2017;34(1):60-77. 3. Kesavadev J. Efficacy and safety concerns regarding complementary and alternative medicine use among diabetes patients. J Pak Med Assoc. 2017;67(2):316-319. 4. Johnston CS, Kim CM, Buller AJ. Vinegar improves insulin sensitivity to a high-carbohydrate meal in subjects with insulin resistance or type 2 diabetes. Diabetes Care. 2004;27(1):281-282. 5. Shishehbor F, Mansoori A, Shirani F. Vinegar consumption can attenuate postprandial glucose and insulin responses; a systematic review and meta-analysis of clinical trials. Diabetes Res Clin Pract. 2017;127:1-9. 7. Mitrou P, Petsiou E, Papakonstantinou E, et al. Vinegar consumption increases insulin-stimulated glucose uptake by the forearm muscle in humans with type 2 diabetes. J Diabetes Res. 2015;2015:175204. 8. Lim J, Henry CJ, Haldar S. Vinegar as a functional ingredient to improve postprandial glycemic control-human intervention findings and molecular mechanisms. Mol Nutr Food Res. 2016;60(8):1837-1849. 10. Cotey S, Harris A. Can taking cinnamon supplements lower your blood sugar? Cleveland Clinic website. https://health.clevelandclinic.org/2016/10/can-taking-cinnamon-lower-your-blood-sugar/. Published October 4, 2016. 11. Allen RW, Schwartzman E, Baker WL, Coleman CI, Phung OJ. Cinnamon use in type 2 diabetes: an updated systematic review and meta-analysis. Ann Fam Med. 2013;11(5):452-459. 12. Costello RB, Dwyer JT, Saldanha L, Bailey RL, Merkel J, Wambogo E. Do cinnamon supplements have a role in glycemic control in type 2 diabetes? A narrative review. J Acad Nutr Diet. 2016;116(11):1794-1802. 13. Cinnamon. National Center for Complementary and Integrative Health website. https://nccih.nih.gov/health/cinnamon. Updated November 29, 2016. 14. Cinnamon. WebMD website. http://www.webmd.com/diet/supplement-guide-cinnamon. Updated March 8, 2017. 15. Graedon T. Which cinnamon is better for blood sugar? The People's Pharmacy website. https://www.peoplespharmacy.com/2016/08/01/which-cinnamon-is-better-for-blood-sugar/. Published August 1, 2016. 16. Herbs, supplements and alternative medicines. American Diabetes Association website. http://www.diabetes.org/living-with-diabetes/treatment-and-care/medication/other-treatments/herbs-supplements-and-alternative-medicines/#sthash.P7FlXEUn.dpuf. Updated February 20, 2014. 17. Diabetes and dietary supplements: in depth. National Center for Complementary and Integrative Health website. https://nccih.nih.gov/health/diabetes/supplements. Updated June 23, 2016. 18. Anderson RA. Chromium and parenteral nutrition. Nutrition. 1995;11(1 Suppl):83-86. 19. Suksomboon N, Poolsup N, Yuwanakorn A. Systematic review and meta-analysis of the efficacy and safety of chromium supplementation in diabetes. J Clin Pharm Ther. 2014;39(3):292-306. 20. Costello RB, Dwyer JT, Bailey RL. Chromium supplements for glycemic control in type 2 diabetes: limited evidence of effectiveness. Nutr Rev. 2016;74(7):455-468. 21. Chromium dietary supplement fact sheet. National Institutes of Health website. https://ods.od.nih.gov/factsheets/Chromium-HealthProfessional/. Updated November 4, 2013. 22. Yoga as a complementary health approach. National Center for Complementary and Integrative Health website. https://nccih.nih.gov/news/multimedia/infographics/yoga. Updated March 15, 2016. 23. Cui J, Yan JH, Yan LM, Pan L, Le JJ, Guo YZ. Effects of yoga in adults with type 2 diabetes mellitus: a meta-analysis. J Diabetes Investig. 2017;8(2):201-209. 24. Vizcaino M, Stover E. The effect of yoga practice on glycemic control and other health parameters in type 2 diabetes mellitus patients: a systematic review and meta-analysis. Complement Ther Med. 2016;28:57-66. 25. Yoga: in depth. National Center for Complementary and Integrative Health website. https://nccih.nih.gov/health/yoga/introduction.htm. Updated September 26, 2016. 27. Beware of illegally marketed diabetes treatments. US Food & Drug Administration website. https://www.fda.gov/ForConsumers/ConsumerUpdates/ucm361487.htm. Updated November 10, 2016.